Chai Preschool is happy to offer several enrichment opportunities for your child. These classes are in additon to the gymnastics and music classes taught in the morning during regular school hours. All classes are taught by professionals in each field and are held on site under the supervision of our own Chai teaching staff. All classes follow a developmentally, child friendly philosophy and are positive and enriching experiences for your child. There are additional charges for these classes. Classes take place from 1:00 pm- 2:00 pm. Our music class is designed to build on a child’s natural love of music and movement. It is a fun and lively introduction to different styles of music, different instruments, and simple musical theory (notes, beat, etc.) Children sing songs, move their bodies and try different instruments during this class. It is a positive activity that is beneficial to so many areas of learning and development. Mr. Barry’s soccer class aims to promote health, fitness and positive social interaction through the game of soccer. The children have great fun and participate in stretches and warm ups to encourage both small and large motor growth and coordination. The class also promotes social development by offering opportunities to work together and problem solve. Teacher Lilach leads a creative art class for children. She uses a variety of mediums and materials to give the children rich experiences in the arts. The class aims to give children an appreciation of art and also to build their self esteem by helping them learn to express themselves creatively. Children create their own piece of art weekly. Sensei Rita, from Twin Dragon Kung Fu Academy, has a background in early childhood development and her goal for our preschool martial arts enrichment class is to blend what she knows about how preschoolers learn with her expertise in martial arts. The class helps children develop physically and cognitively in a fun environment. Classes focus on enhancing gross motor skills, hand-eye coordination, and ability to follow spoken directions and multi-step instructions. The class consists of exercises and drills that help improve balance, coordination strength and reflexes as well as developing self confidence, discipline and listening skills. And, it is FUN! 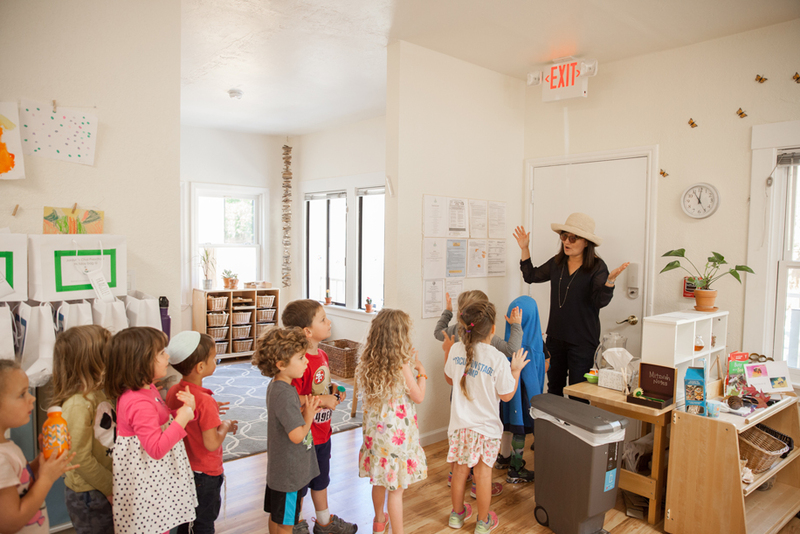 Butterfly Kids Yoga classes offer children a safe and positive environment to begin their yoga practice with play and joy. Classes include games and interactive poses where they learn valuable motor skills and build self confidence and self-awareness, while improving flexibility, balance and coordination. Yoga also helps to increase focus and awareness, and improves overall health and wellness by building strong bodies and minds. Children gain an overall sense of well-being in an enjoyable and supportive environment. One of our wonderful staff members lead a small group of children through a literary food adventure! The teacher chooses a quality children’s book and extends the story to a classroom cooking experience. For example, the teacher might read Stone Soup and then lead the children through the process of preparing vegetables and making soup. They might discuss where food comes from and even plant some of their own vegetables! A great way to appreciate children’s literature and make it come to life! Our drama class is a fantastic way to encourage children to improve their communication skills, to think creatively, to work as part of a group and also to find their individual voices, to role play and work on social development. Using books and stories, puppets, music, and other props, the teacher leads the children in games, songs, activities, skits and other fun dramatic play activities.